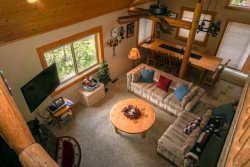 This pretty little lodge is a couple's dream! Location, location, location. This is our most affordable option, located just across from the slopes at the Cornice Express! This single room has a queen bed and is exquisitely decorated. There are two side tables and lamps, coffee maker, microwave, mini refrigerator with a table and chairs for a quick breakfast before hitting the slopes. This condo is perfect for two people who are looking for a great value. You seriously can't beat this place. You are facing the slopes and have a great view of the mountain from right out your window. It's a charming little hotel style room with everything you'd need. Bring an ice chest for longer stays or dine out every night and treat yourself! No cable, Roku w/ Netflix and Amazon; Ipod station. - Located across from the main lift area. Making sure that the wi fi details are very easy and clear and also the parking situation. MANAGER RESPONSE: We have printed wifi instructions in the guest book and are working to make our parking instructions more detailed.